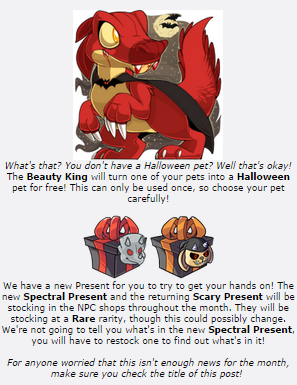 In case you haven't heard or read yet, 2014's new Halloween present is the Spectral Present! To your left is Halloween Festivities - Part 1 . I thought it would be fun to write my own guide so here it is, the following will be the Spectral Present prize list! This guide will be made up by information gathered up myself either by opening a Spectral Present, scanning the boards, or using the search bar. Wondering what the Ghost Costume Item does?